The Twins FX are a special effects company based in Poole, Dorset who provide special effects rental, animatronics for hire and theatrical magic and illusion hire. 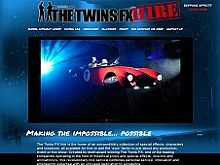 The characters and creations are available to hire from The Twins FX to create wow factors for productions, events and live shows for theatre, television and film productions worldwide. The special effects they offer for rental include unique stage flying effects and theatrical special effects such as flying people and objects without wires. The Twins FX have made a special flying car which can fly from a few feet off the floor across a stage astounding the audience beneath it. They were also responsible for flying daleks in the stage version of Dr Who. Special effects props for hire include bodies, flying chairs, weapons, lamps and hooks. Illusion rental includes the electric chair, levitations, smoke chambers and cutting someone in half. All of our illusions are sure to produce stunning effects. Our animatronic animals to hire include Torchwood the sea monster, Sid the Dragon and Roger the Genie. The creations are tailor made to suit the customer's needs and ideas can be turned into reality with the help of The Twins FX Special Effects Hire.